It is cold. You’ve been noticing the chill on your skin for a few moments prior, as well as the rough grit of sand on your naked body. The light of a new day cascades down upon your opening eyes, revealing a jungle paradise of the wilds. That light also reveals you to a group of nearby raptors. You leap to your feet and take off in a full sprint as the reptilian death machines pursue you. The noise of the pursuit stirs awake another survivor washed ashore, who sits up to spot the hungry creatures descending upon him. You are free for now, but not for long. Ark: Survival Evolved provides a perilous and fairly realistic “world building” experience that pits you against the elements, savage creatures, other humans, and your own body. The game is available today as a “work in progress”, with “content complete” versions being available in Spring of 2017. With the initial versions, you can expect bugs, glitches, weird visuals, and other wild events for the time being. With this in mind, I’m actually impressed with how smooth the game operates currently. If this is any indication, the final product has limitless potential for quality. The primary function of the game is survival, which is done via combat avoidance (most everything is deadly and wants your blood) as well as building and crafting. You’ll forage for berries and materials, build simple tools and clothing, and craft a shelter. As you level up (done by completing tasks and by simply staying alive) you’ll unlock new craftables and make yourself increasingly powerful. Eventually, you’ll be able to build more complex machines and weapons, taking you from a human who can barely survive to one that can thrive in this strange world. As you gain experience, you can grow crops, build storehouses and additional homes for your friends and eventual tribe mates, and anything else that you see fit. Just watch out for the hatchet betrayal or a T-Rex raid, because as soon as you’re dead, you’re respawned in a random location with all items on your person completely eliminated. There are beds that you can craft to create respawn points, so once you get to that point in the game, simply making sure you store things off your person as often as possible can lessen the negative effects of death. Crafting requires resources, which can be foraged from the ground and plants, and tools like a pick, hatchet, or club can be used to take down rocks, trees, and animals. As you unlock new tools and methods of extraction, resources will take on additional uses. Many tools require a little intuitive thinking to use. 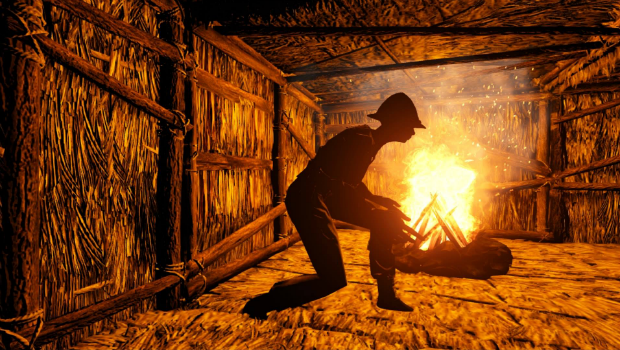 For example, a campfire has three “inventory” slots to store materials such as wood for use to burn. If you put some raw meat or fish in one of those slots along with burning material, you’ll end up with a nice piece of cooked meat for you, a friend, or a domesticated pet. From there on, the game just keeps getting deeper, more complex, and the limits of creation are hard to see at this early stage, but seem boundless. Some of the creations I’ve seen just by wandering around in existing servers are amazing, with large complex buildings situated into mini communities (though almost always long abandoned and locked up tight.) The game also has some fantastic looking upper echelon crafts, such as a large raft. Certain animals and dinosaurs can be domesticated for use as pets and riding beasts, and while I have yet to see this implemented, I’d be shocked if they aren’t eventually capable as being kept as livestock. The game is lacking in two major ways at this time, and I’m finding that solutions are coming slowest for these issues as well. The first regards the game’s graphics, where shadow images of trees, rocks, and other items will appear in the sky, and glimmering light has a very odd effect on surroundings when viewed from a distance. Early on, the game also had some terrible issues with underwater graphics, but for the most part, they have resolved. This is a great sign of things to come in terms of improvements before the full Spring 2017 release, but they changes being made to the graphics while not underwater still don’t seem to be clearing up the issues. The most painful drawback so far is with combat. Hit detection is pretty much as bad as it can get right now. Hit detection is spotty, and I probably connected only a few times out of a dozen swings of my weapon. The animals run in a strange disjointed way, which makes for tedious hunting, and near impossible battles with vicious dinos. The building blocks of a great combat mechanic are there, but they desperately need to be put into place before full release. Overall, Ark: Survival Evolved is a surprising and incredible game. I’m really impressed with the beauty of the landscapes and the truly smooth building mechanics that allow for tons of creativity. I am genuinely anxious and feel a sense of urgency that drives the game forward. The game doesn’t seek to overwhelm you all at once, but puts a perfect drip of lessening health on your in various ways, keeping you active. Minecraft’s zombie hordes and the enemy raids of Terraria are replaced with an ever present sense of the fear of death. Don’t expect peaceful times unless you stick close to a plot of land you’ve secured. While still far from being a fully fleshed out product at this time, there is more than enough to do and a functionality that should be inviting to those players willing to try it out ahead of its final release. Ark: Survival Evolved has the potential to evolve itself into a top game of 2017.